An at-grade intersection is an area where two or more roadways join or cross. It also includes the roadside facilities for traffic movement within the area. Each intersection involves through or cross-traffic movements on one or more roadways and may involve turning movements between these roadways. The main objective of the intersection is to facilitate the convenience, ease, and comfort of people traversing the intersection while enhancing the safe and efficient movement of motor vehicles, bicycles and pedestrians. 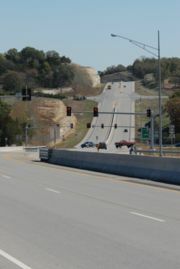 To accomplish this task, the intersection must have the capacity to handle all the volume of traffic flowing through it. The Capacity Analysis for Planning of Junctions is a tool that districts can use to consider alternative at-grade intersection types based upon peak flow volumes. It is important to provide adequate sight distance clear of obstructions within the functional area of the intersection to ensure a driver’s view of other vehicles is not blocked. Signalized intersections can be considered for expressways that pass through communities. In a rural area, a designer is not to consider including a signalized intersection for a new expressway, although one may be installed at an existing expressway intersection with the recommendation of the Highway Safety and Traffic Division. 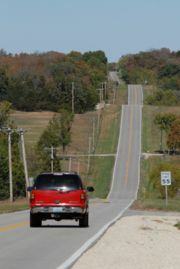 The distance between intersections along MoDOT roadways is dependent on whether the road is major or minor, rural or urban. The Access Management Guidelines is to be used to determine desirable spacing of at-grade intersections. The NCHRP 500 series is a good source of information when considering improvements at an at-grade intersection. Articles in "233 At - Grade Intersections"
This page was last modified on 29 June 2017, at 13:21.